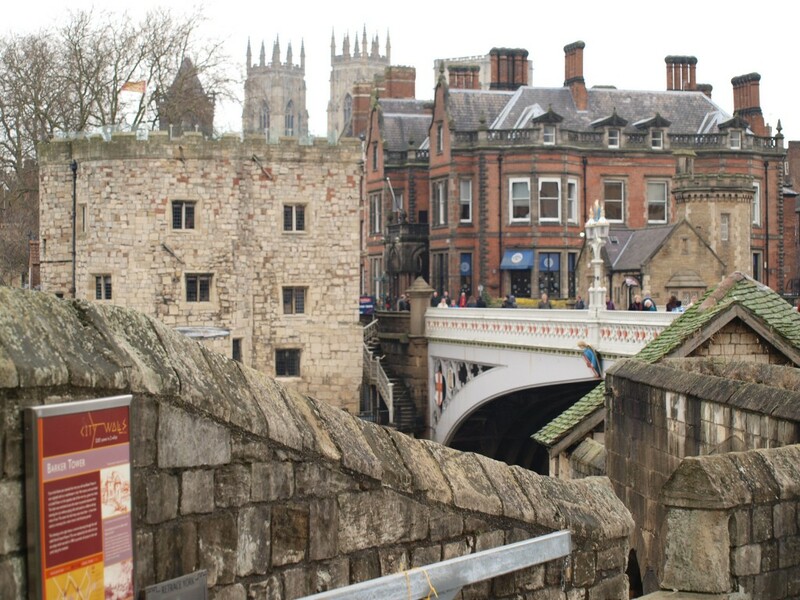 This part begins where the wall-walk stops and Lendal Bridge starts. When you come off the wall-walk the trail runs straight along the pavement, above and past Barker Tower, over the bridge, past Lendal Tower, past a short section of the Walls you can’t walk on, to the main entrance of the Museum Gardens. The pavement is often too busy for you to enjoy the views but when you have come off the bridge a little way [you continue straight on] try to look past the people in front of you. An ugly, yellow-grey-pink, Victorian church half-spire appears towards the end of the road and, thanks to perspective, it soon seems [cheekily] to look down on the massive, elegantly monochrome Minster. 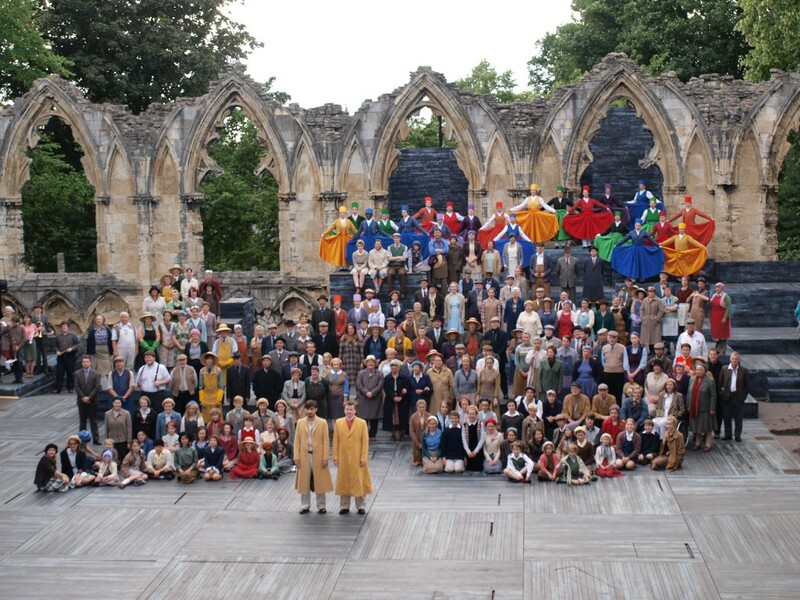 Go into the Museum Gardens for the grand finale of the trail. The trail goes along the main path [stay right at two forks] and on your right, behind the lawn is the Multangular Tower with a section of Roman wall leading up to it. 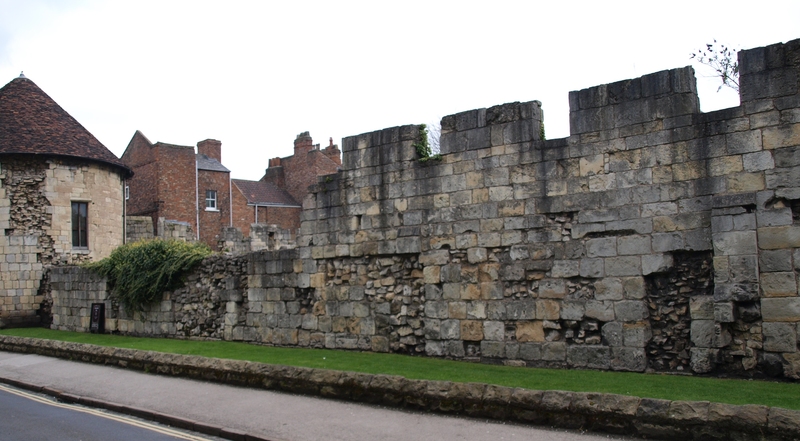 These are York’s best Roman walls above ground, built of neat, small, pale limestone blocks with a stripe of red tiles running through them. They were built at the corner of the legionary fort, possibly at the time when the Emperor Constantius was based here, shortly before he died and his son was declared emperor here [see story below]. 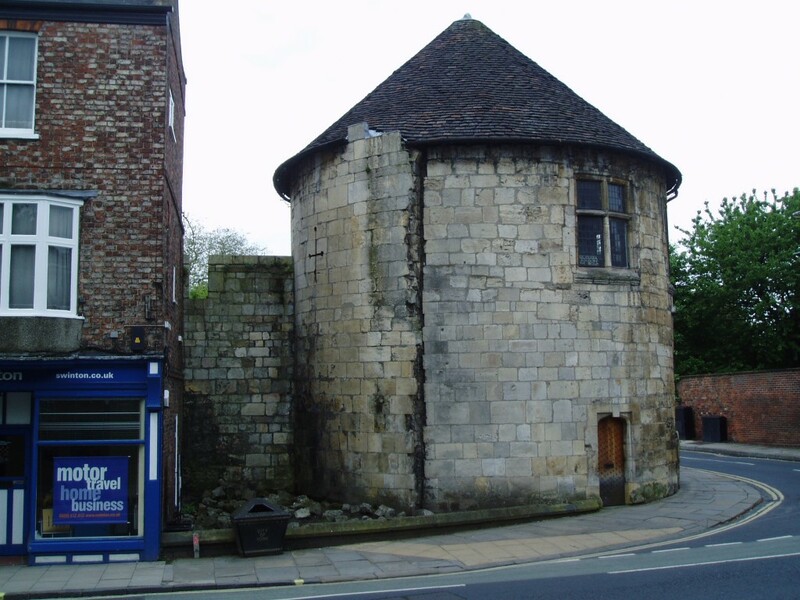 But, like many of York’s best buildings, the tower doesn’t belong to a single time period; it is capped by a medieval wall which is pierced by tall, cross-shaped arrow slits. Moreover, the Roman wall has a rough repair across its red stripe about 3 metres from where it joins the tower –this may well be a repair of cannon ball damage done in the Civil War, if so then this small section unites the three most important times for the Walls: the Roman building, the medieval building and the times when they were last and most actively involved in the defence of York. The trail turns right [off the main path to the museum] immediately after the Multangular Tower, it then goes first right again up a little path that takes you to a gate through the walls where you can look at the inside of the tower; then you retrace your steps as far as the flat ground and turn right, leaving the Museum Gardens by a larger gate. The Walls are on your right here but you can’t walk on them, soon they stop suddenly [where the corporation knocked them down to build a new road into York almost 200 years ago but the trail continues into a square with a statue of a man who helped save the rest of the Walls, he is looking at Bootham Bar. This is where the trail began. The archways through the Walls beside Barker Tower [for its café see the “off-trail extra” for the previous section of the trail] are sometimes called North Street Postern as there was a medieval postern gate here till an early railway company paid the council to let it replace the postern with a big arch to improve access to its railway coal yards. Lendal Bridge is a Victorian replacement for a ferry. 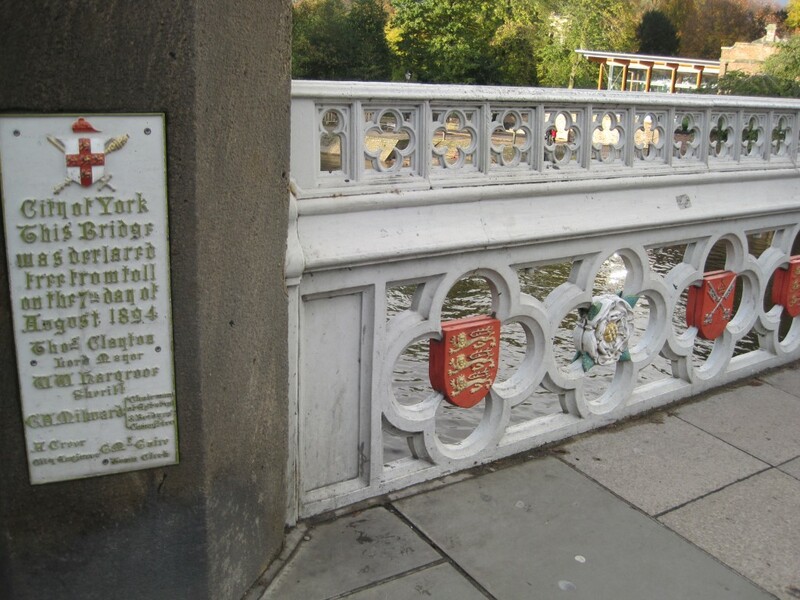 It is decorated with the Minster’s crossed keys and crown, York’s coat of arms, England’s lions and the white rose that became the symbol of Yorkshire in Victorian times [though it was a symbol the Duke of York used in the Middle Ages this dukedom did not give him much power or land in Yorkshire so his symbol was not linked to Yorkshire at this time]. The tower you are crossing towards is Lendal Tower, in medieval times roughly matching Barker Tower on the side of the Ouse you are leaving. 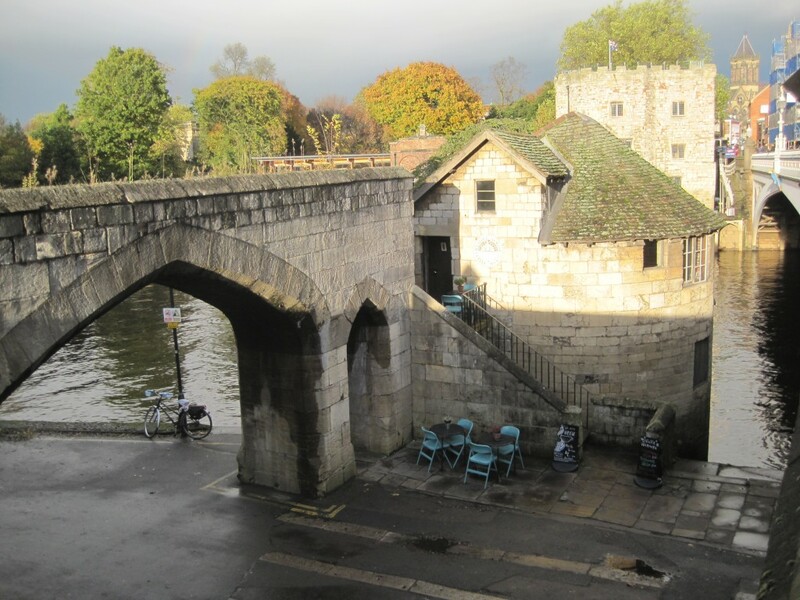 There used to be a chain that could be stretched between the two towers to bar entrance to York for those wishing to attack by boat or wishing to trade without paying a tax. Lendal Tower grew because for 200 years from 1631 it was used as a pump house and water tower; water was pumped from the river to be distributed through pipes [to paying customers] throughout York. The little dark sandstone towers at each end of the bridge on the other side of the road are Victorian, as is the tower which guards the gates to the Museum Gardens. The gardens themselves [and the museum in them] were created a little before Victorian times with a gift of land from the crown [Henry VIII had taken the land from monks in 1539 –more about this in “off-trail extras: 3. St. Mary’s ruins”]. The gift was to the Yorkshire Philosophical Society, a club of local enthusiasts for knowledge which still advertises its open meetings in the tower by the museum gates. The entrance to the gardens are in a puzzling gap in the Walls, which reappear on your right as Roman walls –at first these are behind a flower bed. This bed is “planted in depth” in a way suitable for the gardens of a museum –it has plants of the prairies, trees and Roman coffins. The red stripe in the Walls here is probably partly Roman military swagger [the complete walls had 2 layers of big red tiles, sticking out a little from the pale limestone walls so that their red stripe would be underlined by a line of shadow] and partly for structural strength [the tower walls are made of two thin walls of shaped limestone blocks and a filling between them of rubble and mortar, the two thin walls are tied together by the layer of tiles going right through the whole wall]. 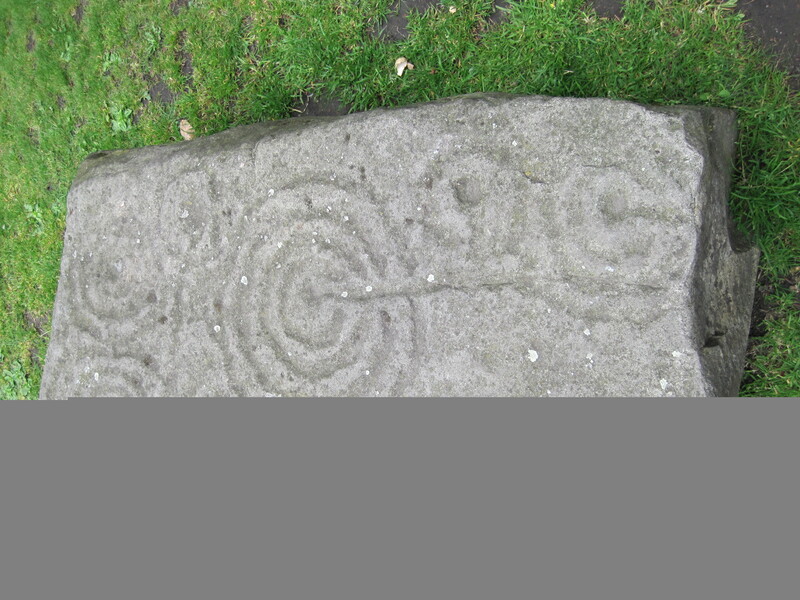 Just past the Multangular Tower, where the trail branches right off the main path, there is a large flat dark stone with “cup and ring” carvings. 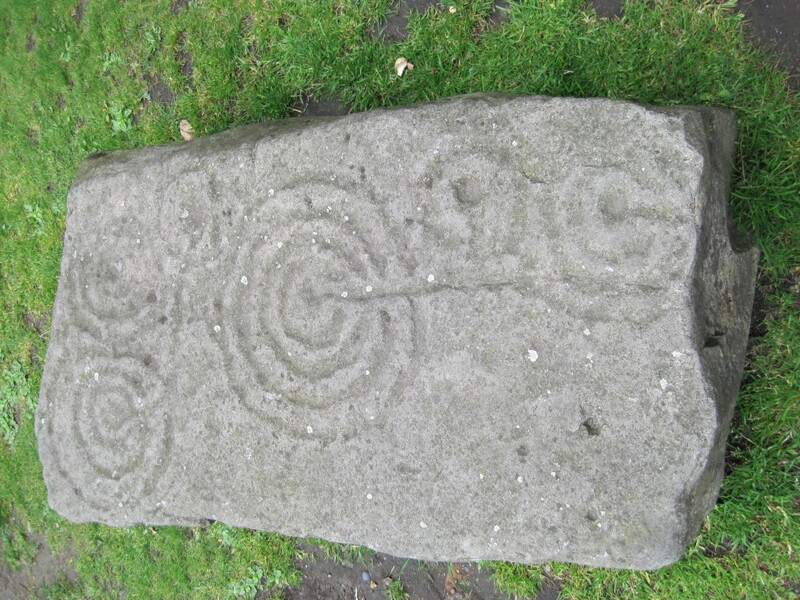 The meaning and exact age of this type of carving is a mystery but it is thought the oldest in Britain. When you have gone up the short branch of the trail to the view of the inside of the Multangular Tower you’ll see the tower walls have the neatly laid inner skin of cut stones but the walls beyond are rough, this is because the Romans had an earth embankment on the inner side of the walls between the towers. 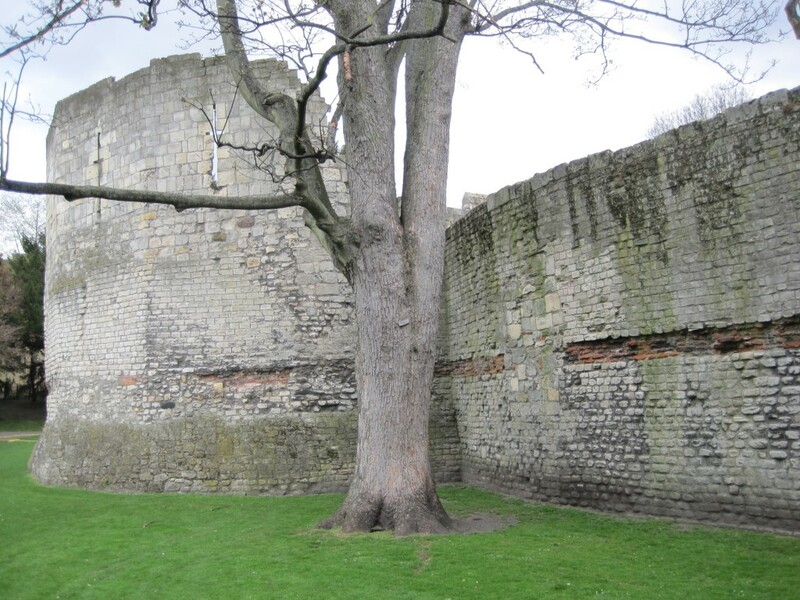 Some experts think this walling and the Multangular Tower were built a hundred years before Constantine, from the time when the Emperor Severus was based in York; some, using the recent dating of tree trunks which support the concrete the Roman walls are based on, think it even older. For more about this area see “off-trail extras: 4. Under the Walls” or the information board immediately to the left inside the little gate through the Walls. As you walk out of the gardens, with the Walls and ramparts on your right, the building on your left is “the King’s Manor” –this started as the house of the Abbot of St Mary’s [leader of the monks who once owned the site of the Museum Gardens] but Henry VIII took it and renamed it. It developed as the headquarters of the Council of the North; its Lord President lived here and, in a sense, ruled the north of England for the monarch from the time of Henry VIII till the English Civil War [for more about this building see “off-trail extras: 5. Café plus”]. When you get to the square where the trail ends you’ll see one side of it has medieval-looking walls [with a tower by an archway], these were built to defend St. Mary’s Abbey [the home of the Museum Garden monks]; what’s left of the city walls at this point is Bootham Bar, it is on the far side of the road that was built by knocking down the bar’s barbican and then 100 metres of the Walls themselves. 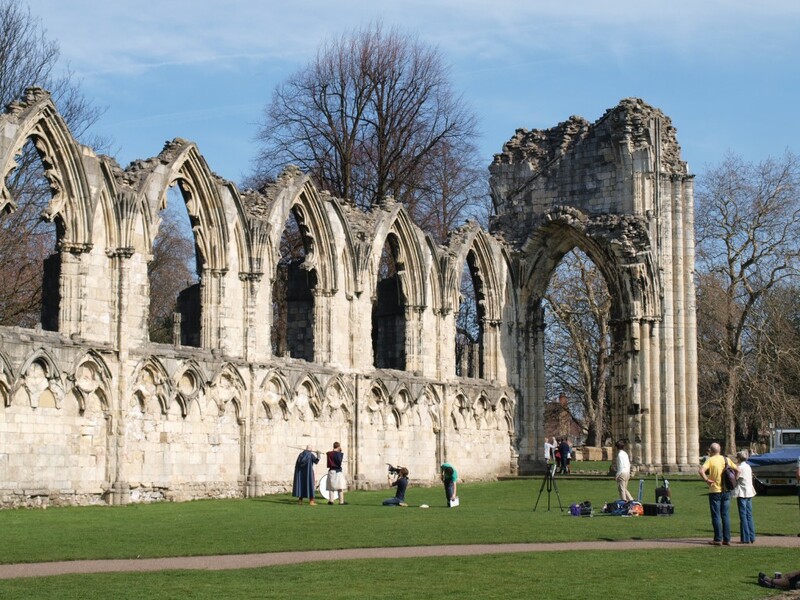 The monks wanted walls to defend them against those York people who resented their wealth and power [for more about these walls see “off-trail extras: 6. 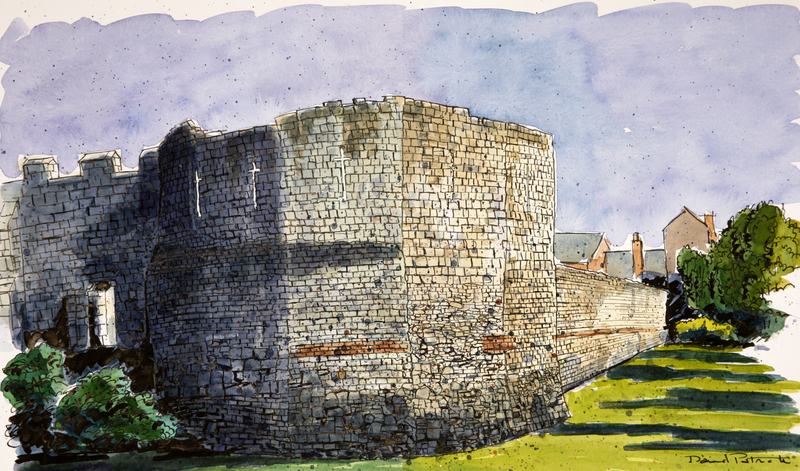 St Mary’s walls”]. 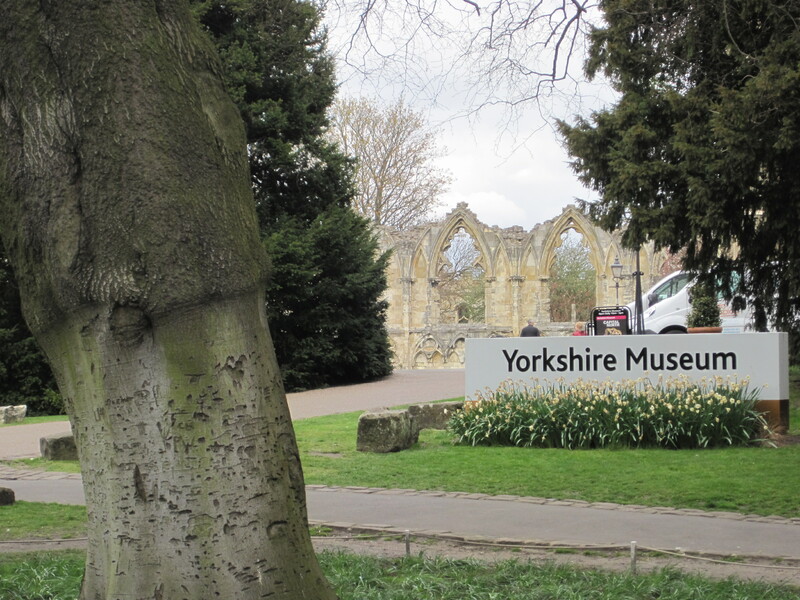 From the front of the Multangular Tower: between trees as you look in the direction the main path is heading you may see the most admired ruins in York, those of the St Mary’s Abbey church; its limestone frames a row of gothic windows [for more about this see “off-trail extras: 3. St Mary’s ruins”]. Many of the trees that frame the views of ruins in the Museum Gardens are themselves interesting. The gardens were set up partly to increase knowledge so there are several very unusual trees here, an example is the big beech tree close to the Multangular Tower; it is sometimes called a “pear-barked beech” or “oak-barked beech” because it has rough bark above the obvious graft line on its trunk. It is registered as a “county champion” tree, this means it is the largest tree of its sort in Yorkshire -but as it may be unique this does not tell you much about its size! There are about 7 “county champion” trees in the Museum Gardens. 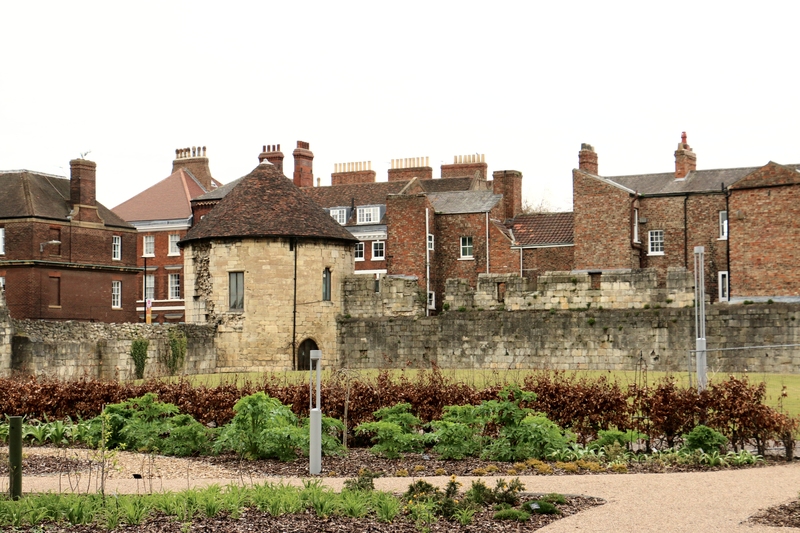 From the small gateway behind the multangular tower: as you stand in the gateway you see a lawn to the left of the rough and rather damaged Roman wall, at the far end of the lawn are the medieval ruins of the chapel and undercroft of St. Leonard’s Hospital. At the near end of the lawn is the inside of the Multangular Tower with several Roman coffins in a coarse, hard sandstone called millstone grit. The medieval parts of the tower have arched embrasures to let long bowmen get up close to the arrows slits designed for them to shoot from. To your left the low Roman wall runs away from you towards a rough tower, here you are seeing what was under the medieval wall’s ramparts until these were excavated, this Roman wall is about a metre into the city from the medieval wall that the gateway is through. The walls of rounded cobbles are recent walls built as supporting and retaining walls after the excavations. For more about this area see “off-trail extras: 4. Under the Walls”. 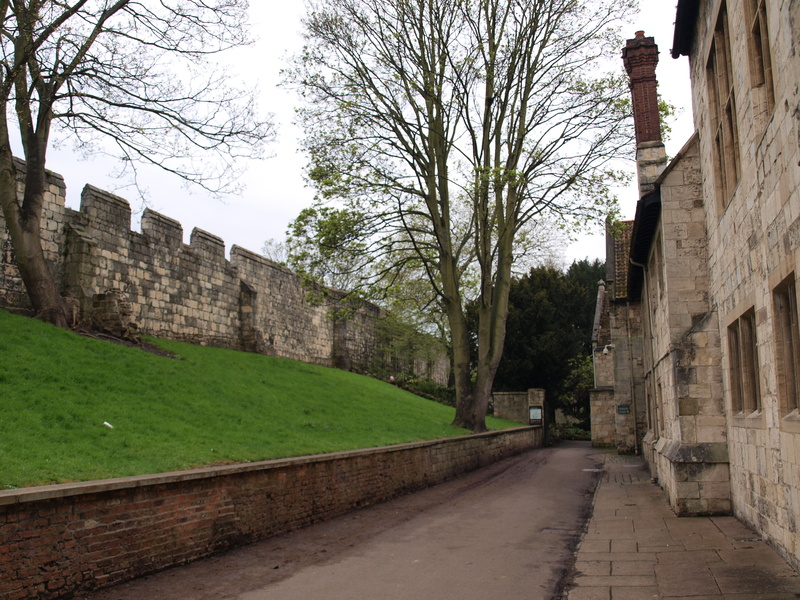 From the square where the trail ends: You see the railings of the King’s Manor [and a little of the manor] on one side of the square, the late Victorian art gallery on the next side, a wall and tower that defended St Mary’s Abbey on the next and a road backed by Bootham Bar on the fourth side. To the right of the bar on this road are 2 very different frontages built at the time of the 1830s road –an officers’ mess then a theatre –and between them a much admired modern extension to the theatre [housing its café]. Immediately to your right after entering the Museum Gardens you can go 30 metres to a medieval, stone-vaulted passage that was once part of St Leonard’s Hospital [for more about the hospital see “off-trail extras: 4. Under the Walls”]. There are the foundations of a rounded Roman interval tower about 10 metres to your left just before you enter the passage. The passage is full of attractive information boards, the first on the left is the one most concerned with the Walls. Two free public toilets for disabled and other people are part of a new restaurant in the Museum Gardens -leave the trail by going first left after entering the gardens, then go first left again, the restaurant is on your right but the toilets are outside it in the corner on your right about 30 metres ahead of you, currently they are just labelled “sluice”. Alternatively there are toilets in the public library which is very close to the trail. To find the library, continue along the pavement instead of going into the Museum Gardens, after about 40 metres there is a small square on your left, the library faces you across the square. As well as toilets it has a café, York archives, displays about York, helpful staff, bookable on-line computers –and books! Its quiet side lawn has a few benches and excellent ruins, for details of the ruins see “off-trail extras: 4. Under the Walls” below. 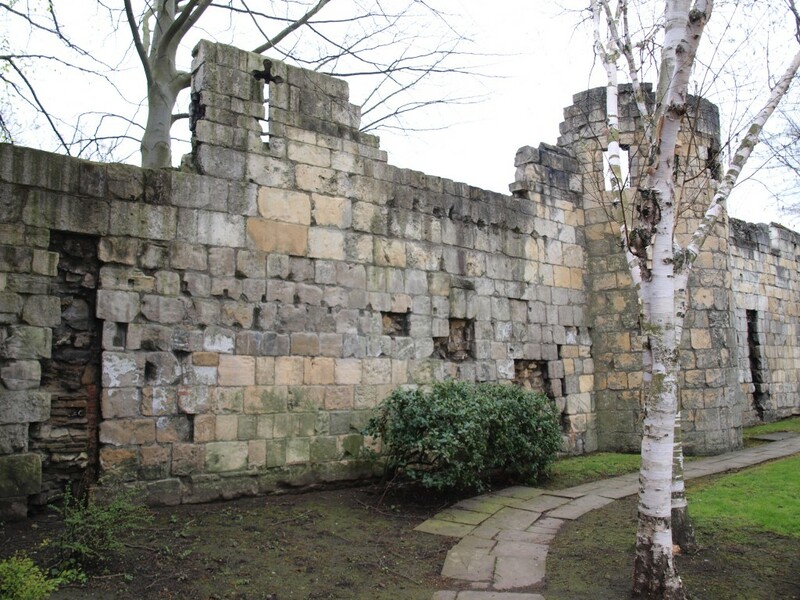 If you face the front of the Multangular Tower you may be able to see to your left the picturesque ruins of St Mary’s Abbey church; they are about 100 metres away. 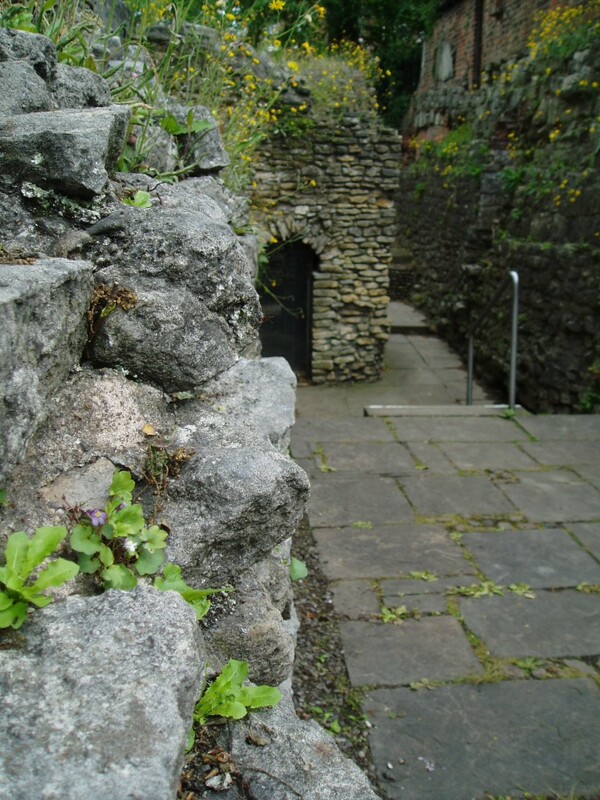 The path that took you to the Multangular Tower will take you on past the front of the Yorkshire Museum to these ruins. The museum was built in the 1820s, it is one of the oldest museums in the country and now, after a recent refit, must be one of the most attractive. It features close contact with many exhibits. 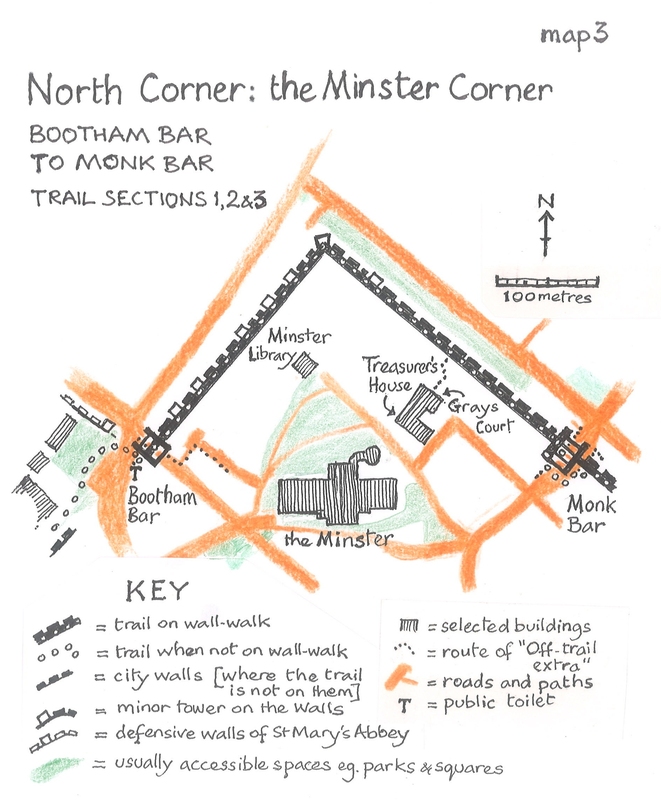 It is particularly good on Roman York and the parts of the medieval abbey that were discovered where the museum’s lower floor is now, there is a charge for those who don’t live in York. 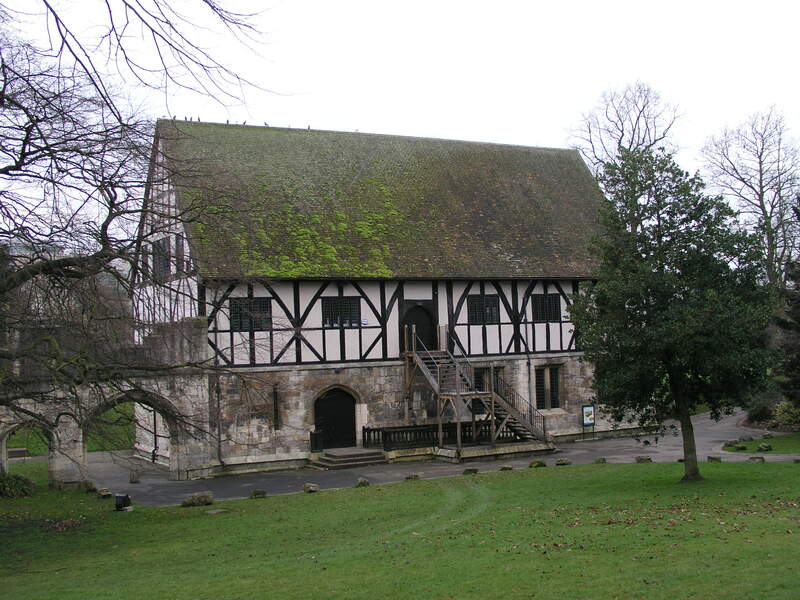 St Mary’s Abbey was founded in early Norman times, it held 50 monks following the Benedictine rule. It became one of the richest land owners in the north of England partly because rich people gave it money and property in exchange for prayers that they believed would speed their souls through purgatory to heaven. As well as these prayers for the dead the Benedictine rule involved services every few hours through the day and night, these were conducted in the centre of their abbey’s church. In the late 13th century they totally rebuilt their church. They built a big one, the windows you can see were down one side of the nave, which was about a quarter of the whole church. It was still in active use in1539 when Henry VIII ordered its destruction. Nearly all “religious houses” [buildings housing monks, nuns or friars] were torn down at this time because they were a probable threat to the power of a king who had just got parliament to make him the head of the Christian church in England. Some monks were executed but St Mary’s monks accepted pensions –and some of them also took paid work in Henry’s new “Church of England”. In the centre of the ruined nave wall you may see many similar little hollows, they are believed to be made by musket balls, possibly from the time there was close fighting here during the Civil War; attackers blew up a tower in the wall round St Mary’s, stormed into these grounds and were then forced back [for more about the tower see “off-trail extras: 6. St Mary’s walls” below]. To the right of the ruined nave wall, just the other side of where the centre of the church was, you can see the best of the garden’s Roman coffins, some with words and images carved in their coarse sandstone. Last paragraph of section :- The coffins mentioned as being “to the right of the ruined nave wall” of St Mary’s Abbey’s church have been removed [possibly only temporary]. At the little gate through the Walls [the one described in “basics”, where you can look down at the inside of the Multangular Tower] you can go further. You will be wandering through the view described above as “From the small gateway behind the multangular tower” so it is best to read that description first before reading the extra details here. You may also wish to read the information board that is to your left, inside the gateway. If you walk towards the ruins of St Leonard’s Hospital you may notice, up against the very rough and damaged Roman wall [on your right], the circular red brick base of a Roman oven [it is not on its original site]. 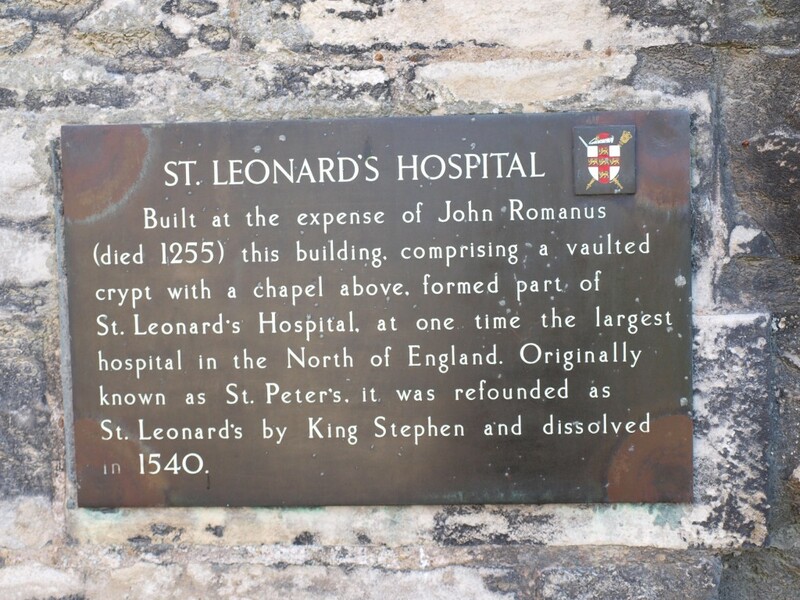 The stone vaulted undercroft of St Leonard’s, and buildings that were where the lawn is now, were probably used for tending the sick –though the hospital was more involved in providing a home and food for the elderly and poor. 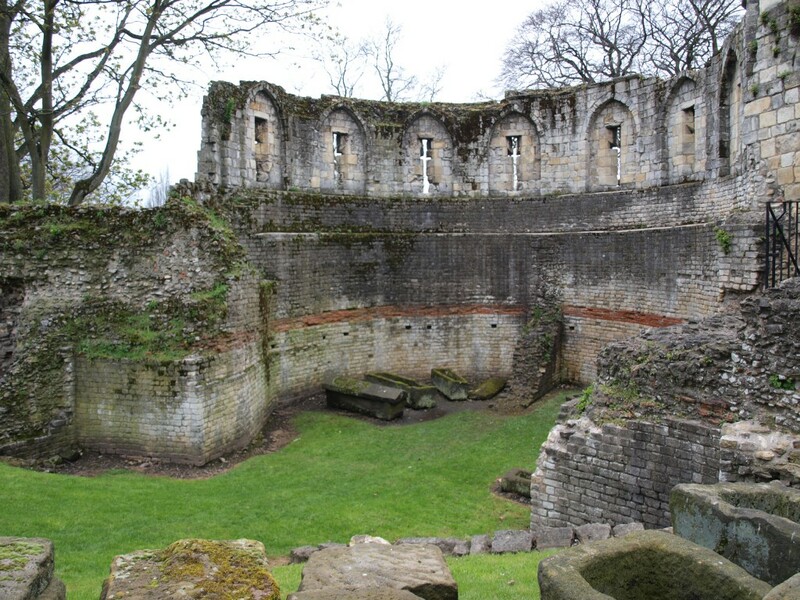 Augustinian canons [and women also following the Augustinian rule] worked and lived here throughout the Middle Ages till this religious house was destroyed around 1540 [for more details of this destruction see “off-trail extras: 3. St Mary’s ruins”]. 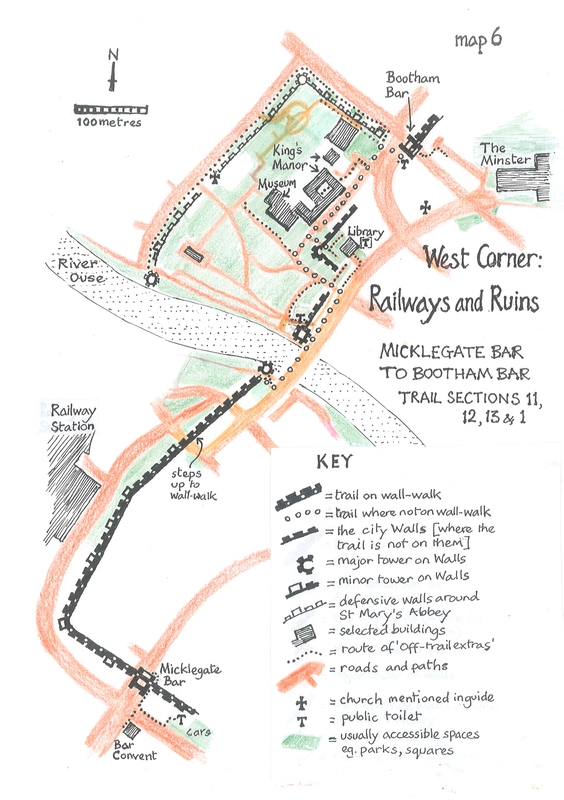 If you walk back towards the Multangular Tower and turn right just before the steps then you will be walking along the inside of the Roman fort wall, the wall that turned a 90 degree angle at the tower. The Roman wall here was under the medieval ramparts till archaeologists excavated them; it is thought that similar walls are under the next 800 metres of ramparts [they are exposed again in part1 of the east corner of the trail]. At the end of this section of Roman wall you come to a small, roughly built tower –this is a mystery called “the Anglian Tower”, Anglians have left us very little building and it is now thought that this is late Roman work, in either case it is probably from a time when the fort walls were beginning to weaken and fall and someone built this rough extra tower with new stone from the hills north of York, rather than robbing old walls or using the main Roman quarries near Tadcaster, west of York. It was the accidental discovery of this tower which led to the excavation of this bit of the ramparts [excavations which led to the death of an archaeologist when his trench collapsed on him]. Beyond the little tower archaeologists have left us a labelled impression of how the ramparts under York’s medieval walls were built up over the centuries. It may help you to understand the confusion of walls here if you realise that you have walked up the rough side of the Roman wall [the side the Romans piled an earth bank against, its other side is one faced with neatly squared “saxa quadrata”]; as you walked, on the other side of you were walls that probably belonged to St. Leonard’s Hospital; the walls of rounded cobbles were built recently to keep you safe in the excavations eg. to hold up the medieval city walls which stand tall here but without any proper wall-walk along them. The rougher old walls here are usually full of wildflowers during the summer. The 80 metre walk to this café is so attractive you might wish to take it even if the café is not open. King’s Manor university café is cheap, good and often quiet but usually it is not open at weekends or after about 3.00 [3.30 in term time]; it often has a board out at the manor’s gates in the square at the end of the trail to give its opening times. To take this walk go through the gate, the lowest part of the building in front of you is the oldest in the very complicated complex of buildings; the building to your right is the newest you’ll see, it is an early 20th century building successfully designed to fit with the rest. 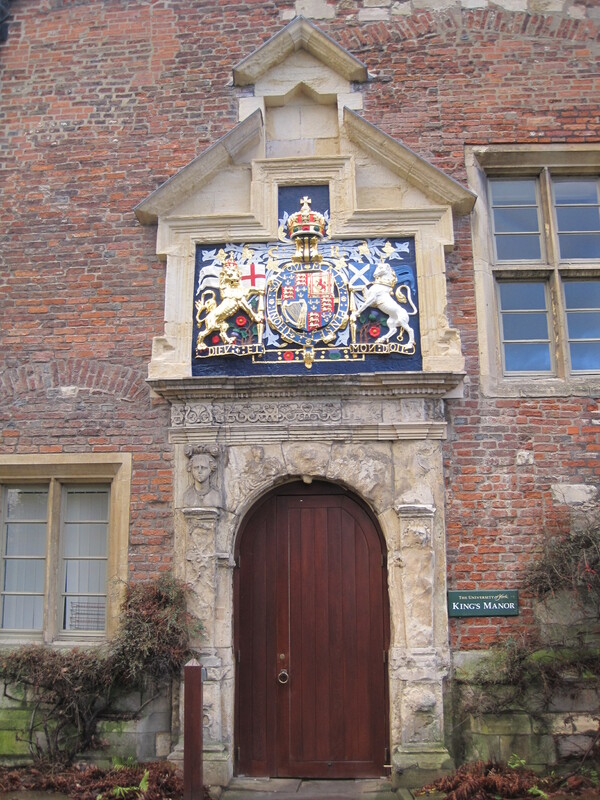 The doorway in front of you had its splendid royal coat of arms added by Charles I who was here just before civil war broke out in the 1640s. You’ll notice that Charles was very proud of the fact that his father and he were the first to be kings of England and Scotland, the Scots thistle and English rose are affectionately intertwined in this carving. His Lord President of the Council of the North, lived here for a while and has his coat of arms carved in the equivalent place in the building that faces you when you go under the royal court of arms and through to the courtyard behind [for more about this Lord President see “South Corner, part1: stories: Plague”]. When you are 10 metres in front of this second coat of arms, then the café is up the open air steps on your left [under another, more weathered carving of a royal coat of arms]. This university courtyard and its quietness remind many people of the college courts and quadrangles of Oxford and Cambridge –in fact, though the age of the buildings is similar, York has only had a university since the 1960s. This flexible extra is mainly for those who are saddened to find themselves at the end of the trail round the Walls. Of course there’s nothing to say you can’t go round the Walls again but you might also like this extra. St Mary’s Abbey had its defensive walls built at the same time as the city’s medieval walls but they have no earlier history so they are not built on top of ramparts. They are more masked by buildings attached to them than the city’s defensive walls but such buildings have mainly been cleared away and a walk along the outside of these walls can be interesting [and peaceful in its second half]. The first half of this walk is about 120 metres and worthwhile on its own. 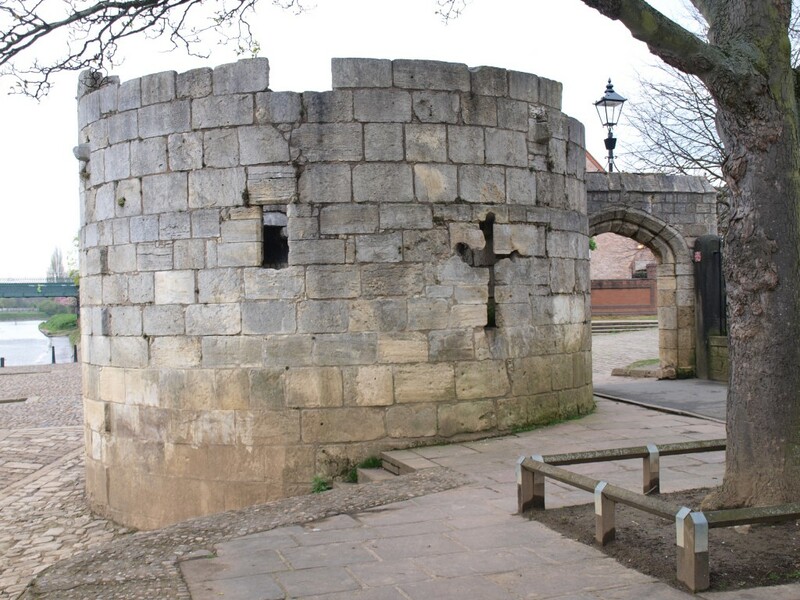 It goes along the near pavement of the busy street called Bootham and starts the other side of the late medieval tower at the edge of the square where the trail ends. This tower was built to guard a side gate to the abbey. A plaque tells you this gate was built for the convenience of Princess Margaret [the princess at the centre of the Bootham Bar story of the 2 sheriffs] but it is now thought that it was really built for her father, HenryVII. At first the walls are masked by buildings but when they appear briefly you can see simple masons’ marks quite deeply cut into them. When they appear for the second time you can see more masons’ marks, an interval tower and the rough stone the wall is built of behind the neatly cut facing blocks. When they appear for the third time it is at their round corner tower. You’ll see facing you a dramatic scar down the side of this tower –this is a vivid reminder of the English Civil War. You can see that to the left of this scar the walls are thicker with a slit window –they are medieval walls built for defence, but to the right the walls have been rebuilt thinner and for more peaceful times [or times when thick walls and slit windows no longer brought security]. The rebuild was necessary because in 1644 soldiers loyal to parliament dug a mine under this tower and exploded gunpowder in the mine, thus destroying the outer wall of the tower. When this wall fell, soldiers attacked here and round the corner, hoping to occupy the grounds of the King’s Manor. 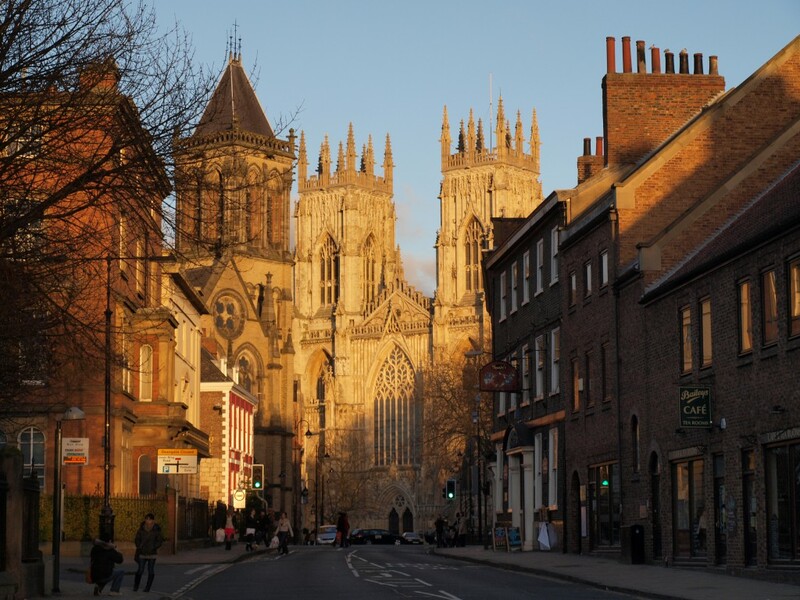 Unfortunately for them they attacked without co-ordinating attacks from the other 2 parliamentary armies besieging York so the defenders were able to concentrate all their forces on this one attack and it was driven back; many of the attackers were killed or captured. The second part of this walk is almost double the distance and continues along the same pavement turning left down quiet Marygate. 10 metres into Marygate look back at the tower to see the door-sized window that shows the tower once supplied guards to a wall-walk. Go about 40 metres on and you’ll see an information board on the walls, it explains that the battlements on the abbey walls had unusual swing-down, wood shutters to protect those shooting down from them. The merlons have grooves at the side [shaped like a dash with a small tail] so the shutters can be fitted and then swing, Two reproduction shutters can be seen in position here. The walk continues past interval towers, past medieval St Olave’s, past the main entrance to the abbey and down to the River Ouse and the round medieval tower beside it. This tower has good embrasures behind its arrow slits to allow archers to get up close to the slit. St Mary’s defensive walls on the other two sides of its grounds have almost completely disappeared. But you can have a more interesting walk back to the trail than a retracing of your footsteps, there are three possibilities: you can turn left when you reach the Ouse and then walk back to Lendal Bridge along its banks or you can go through the small gate which soon appears on your left. This gate goes into the Museum Gardens close to the renovated, half-timbered, medieval, abbey “hospitium” [that was, if tradition is correct, the abbey’s lodging house for travellers]. The Multangular Tower and the trail are just to the right of the museum itself and the third possibility is a path to the left of the Museum; the museum [built in the early 19th century to look a little like an ancient Greek temple] is about 120 metres behind the hospitium –it can be a pleasure to find your way there by paths or over the grass, though you may find the grassed flood defences between the gate and the hospitium too steep and slippery for you to go straight over the grass to the hospitium. The path to the left of the museum goes [since 2015] to the inside of the walls you saw during the first 100 metres of this off-trail extra. The path that runs alongside the inside of these walls goes right to the square where this off-trail extra began, this path is part of “off-trail extra 7”. The path and open space which are used by this extra were opened in 2015. The extra runs on level paving from the square where the trail ends [Exhibition Square]. It goes along the inside of about 100 metres of the medieval walls which defended St Mary’s Abbey. It goes west along the north [right-hand] side of the Art Gallery, if you are using this extra as the end of off-trail extra 6 then the following description will be in the wrong order [and the first part is repetition]. 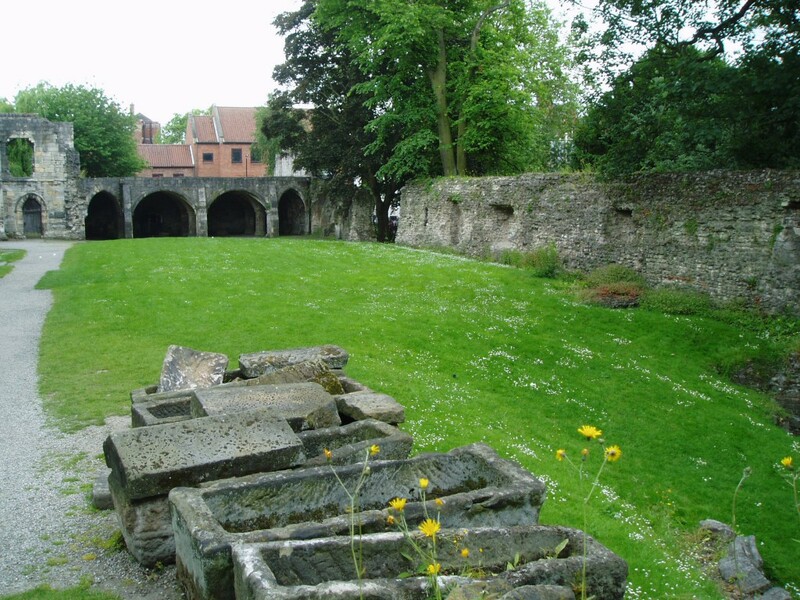 St Mary’s Abbey had its defensive walls built at the same time as the city’s medieval walls but they have no earlier history so they are not built on top of ramparts. The abbey defences form one side of the square and, before they leave the square include a roofed, late medieval tower guarding a side gate to the abbey. 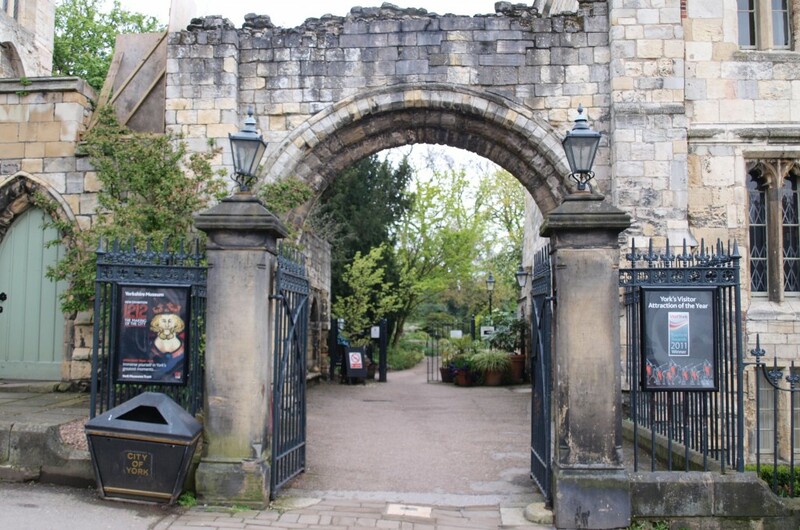 A plaque tells you this gate was built for the convenience of Princess Margaret [the princess at the centre of the Bootham Bar story of the 2 sheriffs] but it is now thought that it was really built for her father, HenryVII. The next tower along the wall is open-backed to ground level , it has a clear, deep-cut mason’s mark at knee-height close to the angle to the right of the centre of the tower’s walls. What look like other, simpler, masons’ marks can also be seen on the walls leading to this tower. The next [third] tower along the wall seems to have a lot of stone that has been scorched pink. It is said that this was scorched by incendiary bombs dropped in an air-raid during the second world war. At this tower you can either turn back, or carry on over the grass or turn left. The left turn takes you quickly to a path though the “edible wood” and past the pebble representation of a historically important geological map of Yorkshire (by the old bowls pavilion) to the ruins of the church of St Mary’s Abbey, you will then be beside the Yorkshire Museum in the parts of the Museum Gardens mentioned in off-trail extras 6 and 3. A new cafe, which is located in the Museum Gardens old bowls pavilion, behind the Art Gallery and the “edible wood”, opened in May 2016 and will stay open throughout the summer months, with the possibility of reduce hours in winter months. The café is vintage themed and also offers picnic baskets for hire, with blankets ! 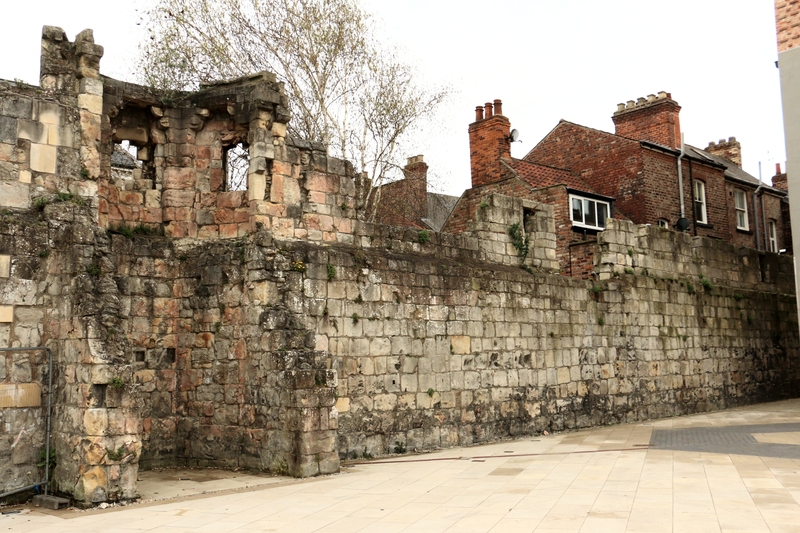 Two sets of fathers and sons, all Roman emperors, lived in York for a while. Severus and his sons, from about 200AD, are scarcely remembered, though Severus was the first Roman Emperor from Africa and from his time we probably have the eastern corner tower of the Roman fort that we can still see. Emperor Constantius, in York about a hundred years later, is no better remembered but his son, Constantine the Great, is amongst the most famous and most important Roman emperors. 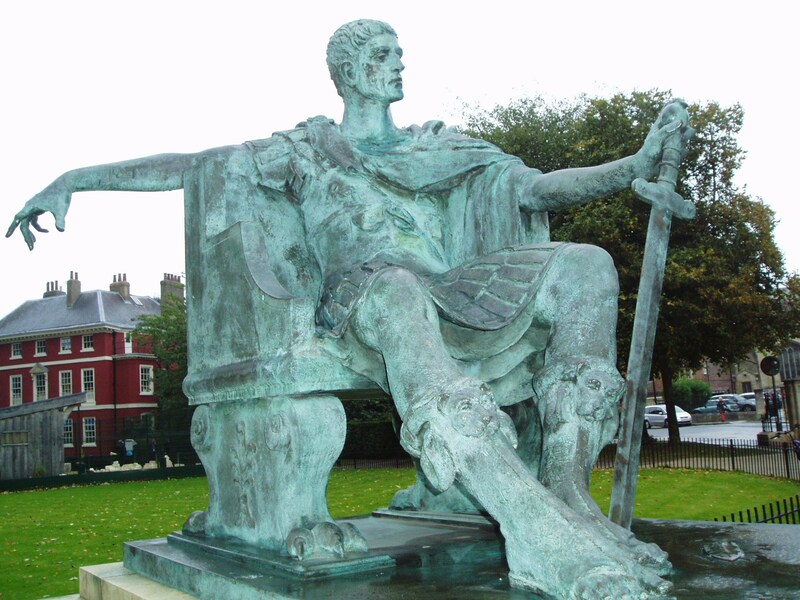 Constantius was the western emperor of a divided empire; he came to York to organise fighting against tribes in northern Scotland, the fighting was successful but he fell ill. His son joined him and when Constantius died, his soldiers declared Constantine emperor in his father’s place. It is believed that this declaration was in York in 306AD when the walls of the Multangular Tower were still new [presumably rebuilt in honour of the newly resident emperor, though some think they were from the time of Emperor Severus, and recent archaeology suggests they are even older]. The soldiers had not cleared their declaration with the other emperors so Constantine had to fight for the title –but he did this so successfully that he re-united the Roman Empire under his leadership. It is said he fought with a Christian-like cross as his banner and the legend is that a vision showed him this cross in the sky with the words “in this sign, conquer”. It certainly seems to be true that Constantine was very close to his mother, Helen, and that she had converted to Christianity, a religion that had faced a lot of persecution in the Roman Empire. Constantine stopped the persecution of Christians and, at the end of his life, he was baptised a Christian himself and left the empire poised to adopt Christianity as its official religion. The Roman Catholic Church has never looked back –or rather it was massively powerful from this time onwards, and spent quite a lot of time and energy looking back at the teachings of Jesus and the infallible judgements of a line of popes believed to stretch back to St Peter. A striking modern bronze statue of Constantine is outside the south door of the Minster. Close by the Multangular Tower the red stripe of the Roman wall has been patched with newer [non-red] stone. Behind the patch there is still a substantial hollow in the wall but there is disagreement on the cause of the original hole. One bit of evidence is an old engraving showing a substantial hole here and describing it as damage from the Civil War [Scots army cannon fire demolished a corner tower in “the trail: west corner: part1”, the same battery of guns could have made this hole]. Others say a house was attached to the inner side of the wall here and hole was knocked through for a window. I prefer to link at least one of the hollows visible on the inner side of the wall to what is usually called a Yorkshire folk tale. 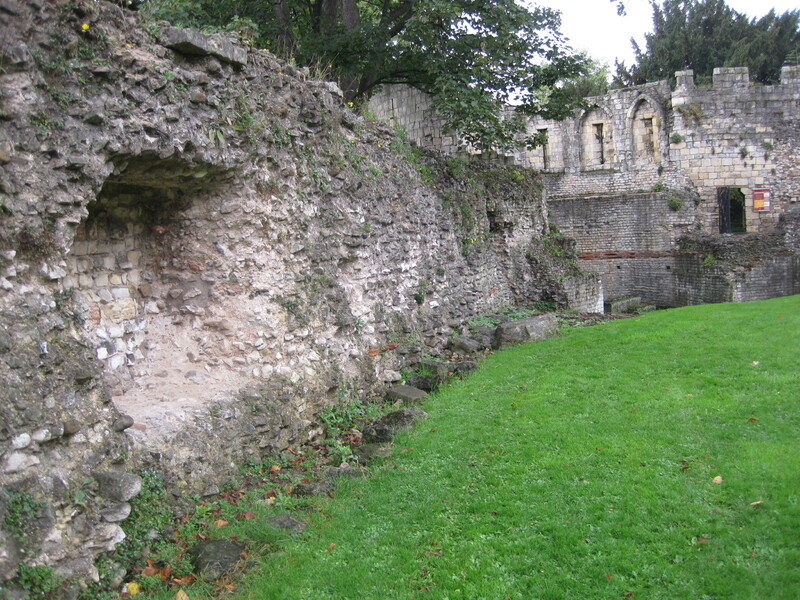 It is usually called a tradition but it is sometimes told as the truth and it is sometimes explicitly linked to St Mary’s Abbey and St Leonard’s Hospital, two institutions run by different orders of monks yet separated by little more than this ancient wall. A brief version of the story tells that Brother Jocundus was a monk at St Leonard’s. To be more precise, he belonged to the community of Augustinian canons who ran St Leonard’s Hospital, and he was a good enough canon except for his weakness for strong drink. This weakness led to his being found drunk at a local fair and, as he was far from sober when asked to explain himself to the master of St. Leonard’s, he caused so much offence that he was given a rather extreme punishment –he was taken to a convenient hollow in a wall at the edge of the hospital grounds and was walled-up in it, walled-up to die. When he sobered up he was reluctant to die in this way so he loosened enough of the crumbling old stone work to get out of the wall -he found himself on the other side of the wall from his fellow Augustinians. In fact he found himself in the Benedictine Abbey of St Mary’s. Somehow, probably with little reference to the truth, he managed to persuade the Abbey to accept him as a novice monk. He was so relieved by his deliverance from death in the dark that he was able to stay away from strong drink for a whole year but then events repeated themselves. The abbot had him walled up in the same convenient hollow he had emerged from a year before. Jocundus, once sober, unsurprisingly attacked the wall the Augustinians had built up a year before, it was slow work but unexpectedly he soon had help from some of the same canons who had built the wall. His knockings and scrabblings had disturbed the monks in their quiet prayers for the soul of their master who had just died –they were astonished to find Jocundus alive and well after a year inside the wall, they declared it a miracle, a message from God that Jocundus should be their next master.